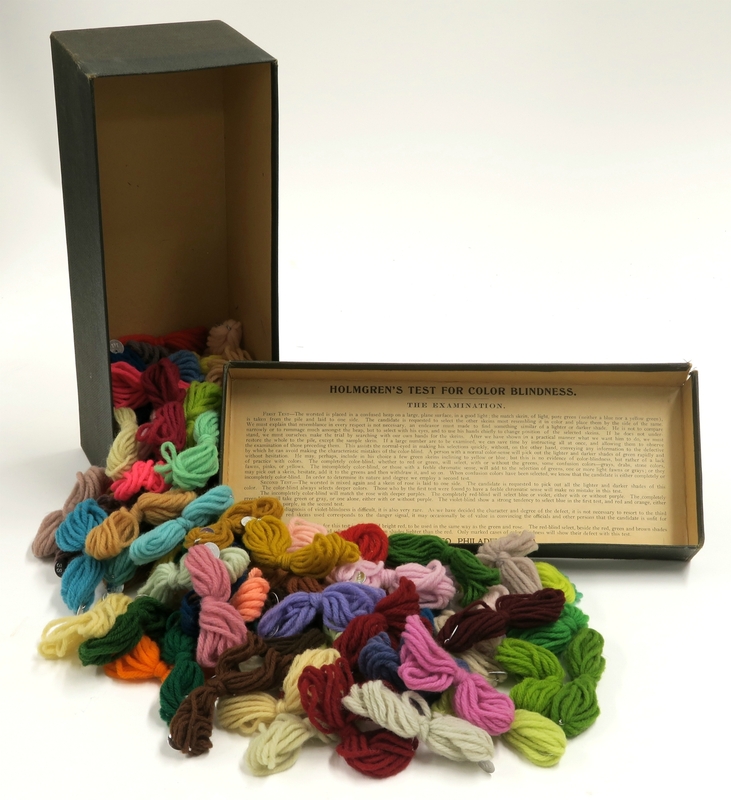 The color test contains several dozen skeins of wool. The test’s instructions are found inside the box, under the lid. It explains that in the first phase of the test, a skein of green wool is isolated from the group. The person being tested must identify other skeins of the same color, but with lighter or darker hues. Phases 2 and 3 of the test work using the same principle, but with a pink and then red skein. The Holmgren’s test for color blindness manual is located in the box lid. A person who sees colours correctly should be able to easily select the various shades of the same colour. However, depending on how the test is used, it is possible for a patient to make a mistake and incorrectly select certain shades. According to the instructions, this would be caused by the patient’s “lack of practice” with the colours. Under the test, colour-blind people discover the colour they do not perceive, usually red and green. But being unable to differentiate blue or yellow, or seeing only shades of gray, is still possible. This last condition is called achromatopsia. To discover more about the heritage of the Augustinian Sisters, visit the Monastère des Augustines’s museum. Explore other documents on the Archives Center website.